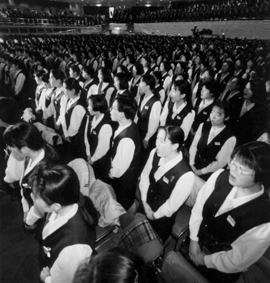 OL in uniform attending the hiring ceremony, 1993. In Japan, young working women are often referred as OL (an abbreviation for Office Lady). Before this term came about, working women were called BGs (Business Girl). However, some people pointed out that this term was used to refer to prostitutes in the United States. Therefore, in 1963, a women’s magazine conducted an “Opinion poll for a name to replace BG”, and OL, which won the most votes, became a common name.There is no strict definition for the term OL, but in general, this term is used to refer to a woman who is single, young, and does clerical work as a fulltime worker. Some working women dislike the description of OL as they feel the word’s emphasis on femininity is discriminatory. Although OL’s income is not that high, this group has a large amount of money to spend on themselves because they tend to live at home with their parents and do not have to support a family. Therefore, OL are considered to be trend setters of consumer life, and during the Bubble Economy of the late 1980s, many companies targeted them as consumers.